At the recent Pro Mobile Conference, veteran mobile DJ Derek Pengelly was presented with the first ever Pro Mobile Lifetime Achievement award to recognise his significant and prolonged contribution to the mobile DJ community. Derek has been a mobile DJ since the 70s and a regular contributor to Pro Mobile since the very early days of the magazine. Having travelled the world seeking out DJ training, he became a pioneer of DJ education in the UK. Through seminars, workshops and one-on-one mentoring, Derek has helped countless mobile DJs improve both their DJ businesses and performances. Derek was also instrumental in transitioning the long established Thames Valley Disc Jockey Association into the current National Association of DJs and served on the national committee both as Branch Development Officer and Chairman. Having semi-retired to Cyprus a few years ago, Derek decided to distil his many years of DJ experience, as well as the information he had learnt from many other pioneering mobile entertainers around the world, into a book which was also launched at the Conference. Wedding Marketing For DJs is a comprehensive collection of ideas and advice for both established and aspiring Wedding DJs. It is now available to order from the Pro Mobile Book Store priced at £11.99. 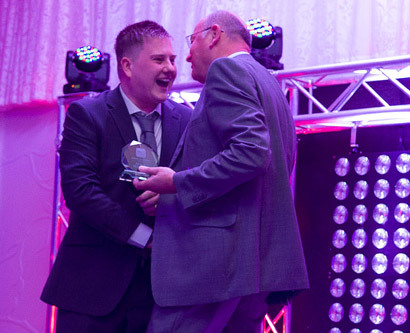 Editor Eddie Short presented the award at the start of the Pro Mobile Gala Dinner during the first Pro Mobile Conference, which took place at the Crowne Plaza Heythrop Park near Oxford. Derek received a standing ovation as he took to the stage to receive the award and, although clearly moved by the unexpected honour, gave a short heart-felt acceptance speech.